A team of students from IUPUI’s School of Engineering and Technology earned a second-place finish and $10,000 at agBOT Challenge 2018, which was held May 17-19 at Gerrish Farms in Rockville, IN. With a field of 11 teams, the IUPUI team tied with the team from Purdue University, West Lafayette; Nexus Robotics of Nova Scotia, Canada, won the championship title, along with $30,000. The agBOT Challenge is a series of competitions designed to encourage innovation in robotics and agriculture. Individuals, teams, universities, entrepreneurs, and farmers from across the globe are challenged to build autonomous vehicles capable of performing agricultural tasks in the fields. IUPUI teams have finished fourth in the Weed & Feed competition in the last two years of the competition. 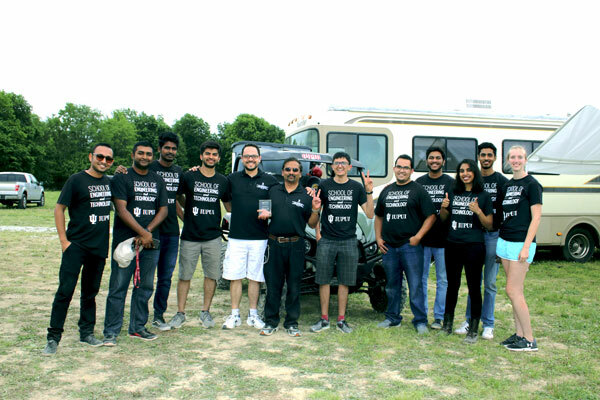 Members of the IUPUI agBOT team in Rockville, IN (May 18, 2018). From left to right: Aniket Shimpi, Sayem Khan, Harsha Nimmala, Arjun Ambasana, Dr. Andres Tovar, Dr. Sohel Anwar, Sohin Shah, Mounir Karmada, Shalem Shelke, Aarthi Ilangovan, Adish Anandkumar, Kathryn Schmahl. The team, comprised of mechanical, electrical engineering, and computer science students, created a driverless robot that identifies and eradicates three types of weeds in corn fields with a minimal amount of herbicides or by mechanically removing them. They demonstrated innovations capable of autonomously moving through the fields to identify plant health with detection algorithms and eradication of weeds. In addition to Dr. Anwar and Dr. Tovar, Dr. John Lee, associate professor of Electrical and Computer Engineering, Dr. Mohammad Al-Hasan, associate professor of Computer and Information Science, and IUPUI alumnus Tim Allen, of A&R Erectors, Inc., assisted students with the project.